If you ask us the buzzword of this time and age, we would have to say it is “micro learning”. Used by educational institutions and corporations as it allows the learners to acquire information in very specific bursts. Moreover, micro learning appeals to them as it is available to them exactly at the time of learning need. This means the learners are in control of what and when they are learning. Some of the diverse formats of delivering content for learning include multimedia videos, emailers and e-books. It allows the learners to set educational goals for themselves and acquire knowledge at their own pace. It gives learners the choice to begin and complete a learning module they are actually interested in. Microlearning games provide a good way to expose learners to things they don’t know about. The various formats used to create microlearning nuggets are as per individual learning styles – which makes the entire learning process fun and interactive. 1. Microlearning can be used to learn everything. No, it doesn’t work in the case of all kinds of subject matter. For instance, mastering a new software or a new language requires time and patience. Imagine learning the basics of biotechnology by just listening to a 5-minute micro learning podcast. Have you ever seen someone master Japanese by just watching a 5-minute video? We doubt that! Therefore, areas which comprise numerous skills and subtasks can’t apply the strategy of micro learning. 2. 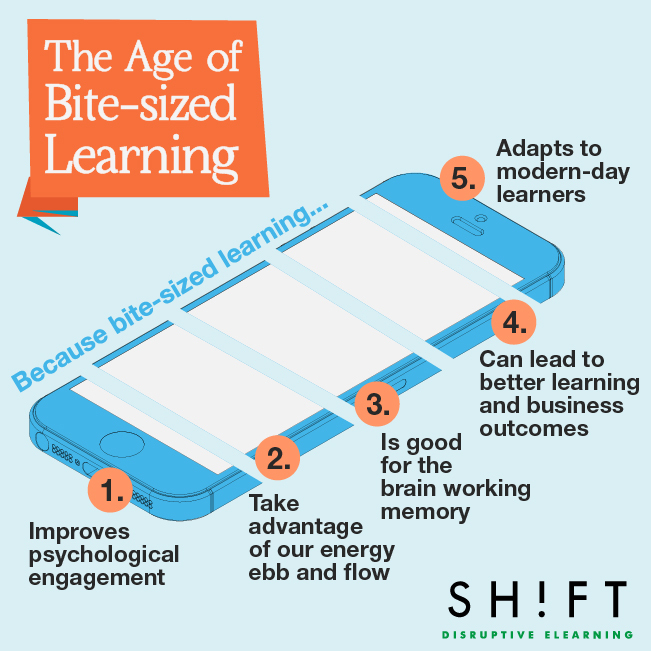 Micro learning replaces e-learning. Certainly not! E-learning, in simple words, is the learning that takes place with the help of electronic media, typically on the internet. Just because micro learning makes use of internet doesn’t mean it has taken the place of e-learning courses. In fact, micro learning is just a support tool that enables faster acquiring of information through specific educational or informative nuggets. It merely improves retention and comprehension of those who are running against time in their daily lives (eg: working professionals) or have a short attention span (eg: students). On the other hand, micro learning comes under e-learning. For instance, learners watching an online presentation covering the basics of a specific topic comes under e-learning. At the same time, this mode of learning makes use of a micro learning technique which – in this case – is the online video. 3. Reading micro learning nuggets is not enough. The misconception here is that learners can simply gain knowledge by just watching a brief online video or reading a small e-book. Such is not the case. To be able to acquire information, learners need to consistently fill the educational gaps. Discussing the topic beforehand and reviewing the information afterward is the most important step in the micro learning cycle. Learners should also evaluate their knowledge “before and after” after the learning has taken place. 4. There is a time limit for micro learning. Not necessarily – because it varies from learner to learner and subject matter to subject matter. Someone might say it doesn’t take more than 5 minutes, another person may say that finishing a module is possible under 3 minutes. The reality is that micro learning doesn’t have such time caps. Learning nuggets are defined as complete learning experiences as long as they are complete. They may be an hour long or just under 5 minutes – it totally depends on the content and context of the nugget. 5. Micro learning is based on content chunking. Chunking is defined as the process of taking individual pieces of information and grouping them into larger units. This is done so to improve the information a learner can retain. Let us tell you something interesting – content chunking is an important aspect of micro learning but it is just one aspect of it! Contrary to popular belief, it is not just easy to divide a heavier piece of information into chunks. Each micro learning module contains an entire thought or is a standalone unit in itself. It covers the core ideas of the task or sub-topic. It takes time to package micro learning content, something that will stick to the learner and not leave him wanting for more. Imparting fragmented information to the learners is not the aim of micro learning. At Oust, we are constantly innovating to provide a fully-integrated microlearning platform that provides all these capabilities. We also help our clients to create highly engaging content that leverages our proprietary pedagogy of delivering critical learning outcomes at scale. The mobile platform provides unparalleled distribution, and with the advent of machine learning and artificial intelligence, offers an opportunity to highly personalize the learning content for every individual.